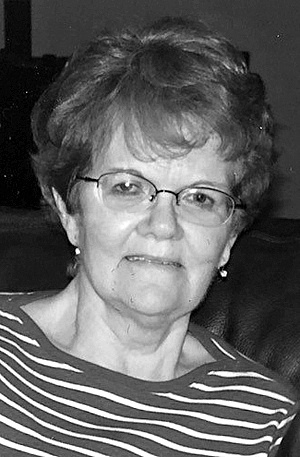 Rita Ellen Garrelts died peacefully Friday, February 23, 2018 at the Wesley Healthcare Center after a long struggle with Parkinson’s disease. Rita was born on January 12, 1937 in Tupper Lake, to the late Clara Mary Dumoulin Sarazen (1995), and Leo Joseph “Buck” Sarazen (2009). She was married August 21, 1955 at Holy Name Church in Tupper Lake to her high school sweetheart, Lural Gerry Garrelts. They celebrated 59 years of marriage. Rita and Gerry were blessed to have seven children. Rita worked for many years for WSWHE BOCES as a special education teaching assistant. Rita loved to bowl, walk, and loved to watch sports. As a young woman she participated in sports and was a cheerleader and would enthusiastically do the cheer for Tupper Lake High School when asked! She looked forward to visiting Tupper Lake in the summers to see relatives and friends. In addition to her parents and husband, Rita was predeceased by an infant daughter Janlynn Clara Garrelts in August 1958. Survivors include Michael Lural Garrelts of Buffalo, N.Y., Girard Lynn Garrelts (Deborah) and Richard David Garrelts all of Saratoga Springs, N.Y., Robert Leo Garrelts (Jeff Freebern) of Gansevoort, N.Y., Douglas Shawn (Tania) of Raleigh, NC and Laurie Ellen Garrelts Russo (Joseph) of Wake Forest, NC, Seven grandchildren; Kyle Lural Garrelts, and Elyse Marie Garrelts of Saratoga Springs, N.Y., George Wilms and Amelia Louisa Garrelts of Raleigh, NC, Nicholas Leo Russo, Greyson Joseph Russo, and Maxwell Garrelts Russo of Wake Forest, NC. Survivors also include a sister, Irene “Tuni” Root of Rochester, N.Y. and two brothers; Richard Sarazen (June) of Simpsonville, SC and Leo Sarazen (Elaine) of Piercefield, N.Y. Relatives and friends may call from 5 to 7 p.m. Thursday, March 1, 2018 at the William J. Burke & Sons/Bussing & Cunniff Funeral Homes, 628 North Broadway, Saratoga Springs (518-584-5373). A Mass of Christian Burial will be celebrated at 10 a.m. Friday, March 2, 2018 at St. Clement’s Church, 231 Lake Avenue. Burial will be in the family plot at St. Alphonsus Cemetery in Tupper Lake in the spring. Those wishing to make a memorial contribution are asked to consider The Michael J. Fox Foundation for Parkinson’s Research P.O. Box 5014 Hagerstown, MD. 21741-5014.